iPad User who use iPad frequently often wonder that is there any app which can give them some sort of relaxation regarding their files as file management is supposed to be a typical task for iPad users. Many iPad users have lots of things to deal with as apple’s ios does not allow any third party apps to access file system directly or any other files like media/photos/docs which are stored in other apps and all the ios devices have this restrictions because of the security architecture apple want to put on their devices, but what about general files which you can manage, sometimes people find it really difficult to transfer their file to PC/mac from iPad. Often you want to take your pictures from iPad to PC/Mac, but could not do it because of apple’s security. You can not manage your files better and efficiently while you find it problematic if you have to find one files from a large collection of scrap files, you can not sort them, tag them so that others can understand them better. Moreover, No matter how pro-efficient you are on your iPad, you found yourself always puzzled in clutter files of iPad. 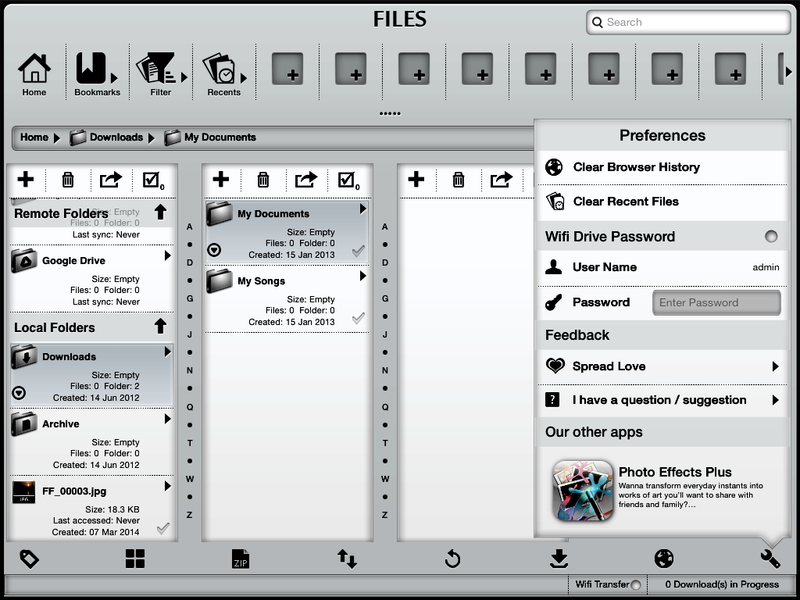 Now, with Files-Finder Edition App you can have a better file management on your iPad as this app have lot’s of brilliant features which can totally change your file handling experience on your iPad. The Most fantastic feature of this app is that it have pretty familiar interface for users who are from Mac and Windows background and now switching on iPad. Sometimes it happen that users who switch from windows to iPad find it really difficult to manage files on iPad because of the interface problems they face on ios device. Additionally, users who have switched from Mac environment will this app much like finder of Mac. App has gesture controlled interface with touch screen optimization. 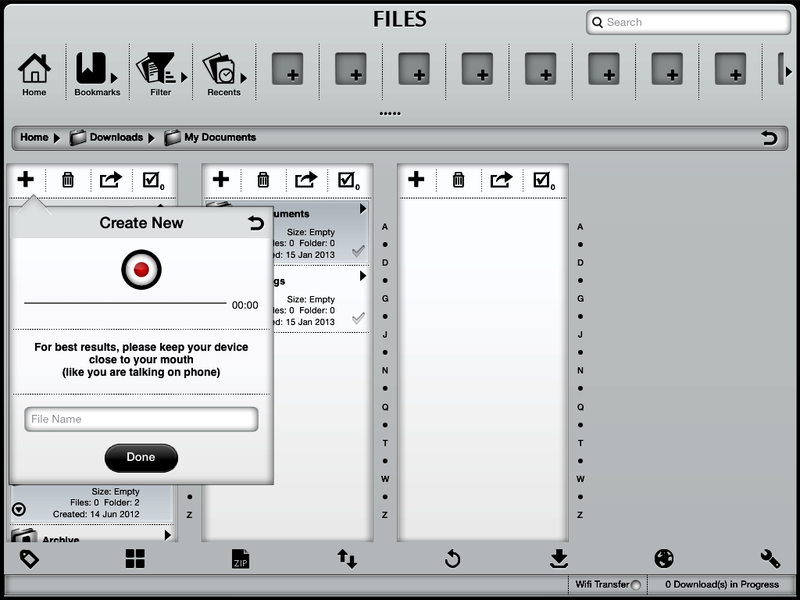 App supports a wide range of file formats so you won’t be having problem regarding unknown file formats. App have a built in previewer for most of the file types. For users who often store their ipad files on cloud networks like Googledrive, sugarsync and dropbox, files-finder edition lets you store your ipad files on such networks while being on the same interface. Most important aspect for which most of the ipad users keep worried i.e. editing their files on iPad. 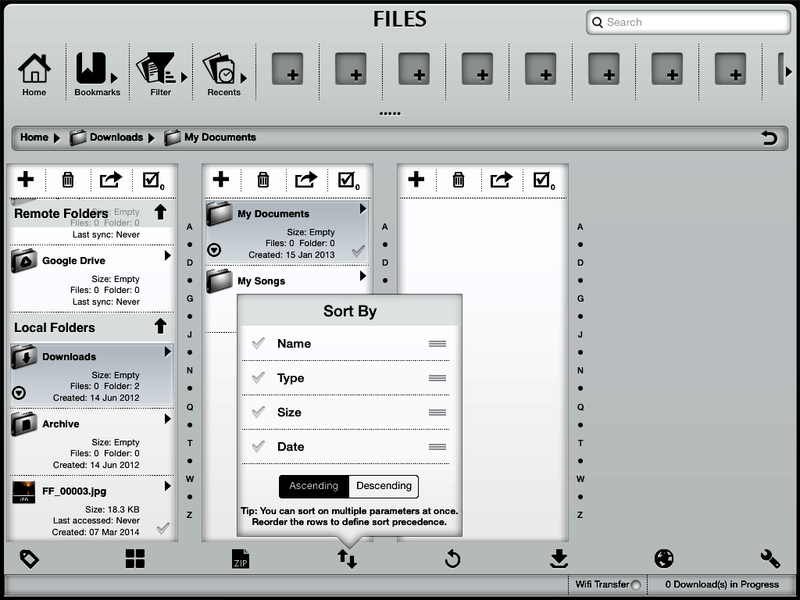 With this app you can edit your doc, docx, excel files and other documents online. You can create short-cuts for files you frequently use and you can also assign them filters. 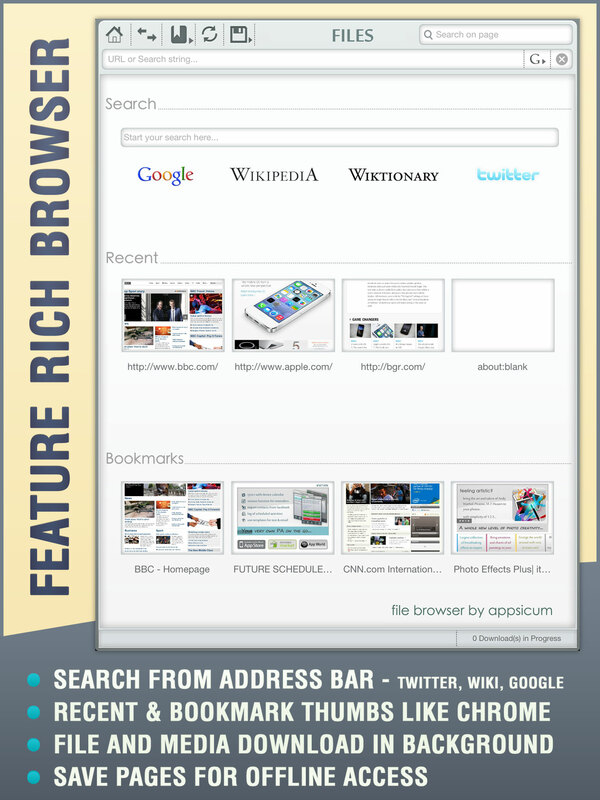 This app has functional address bar/breadcrumb to enable quick navigation. There is in-built browser with back download support and one download manager is also there to show the documents you have downloaded on your ipad. You can lock your important files with password. Browser’s search is integrated with Twitter, Wikipedia and Dictionary along with Google so you can now search directly with your browser’s address bar. 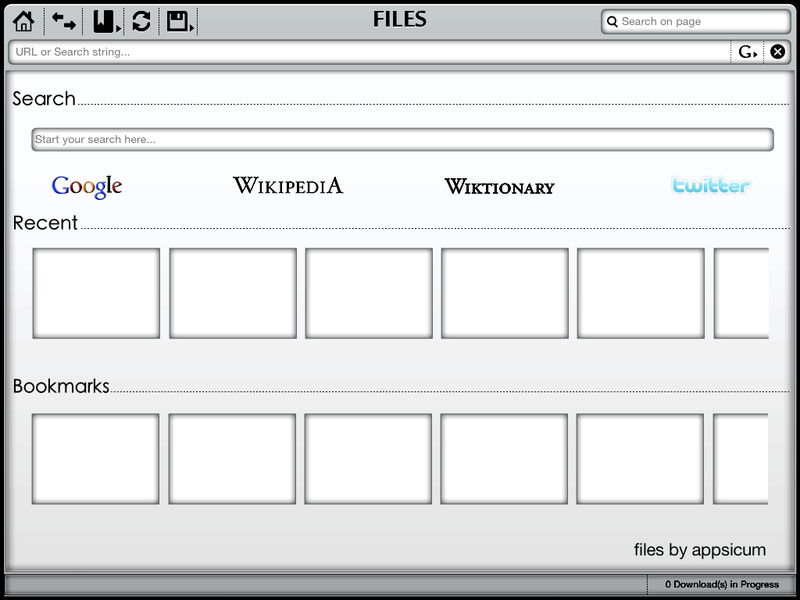 You can search and filter your files according to file tags, file types,file size etc. You can create voice note creation just like you create voice notes in Evernote. Wi-fi file sharing with password protection is enable so you can send your files securely. Here I am Publishing Some of the Screen shots of This App Taken By Me. 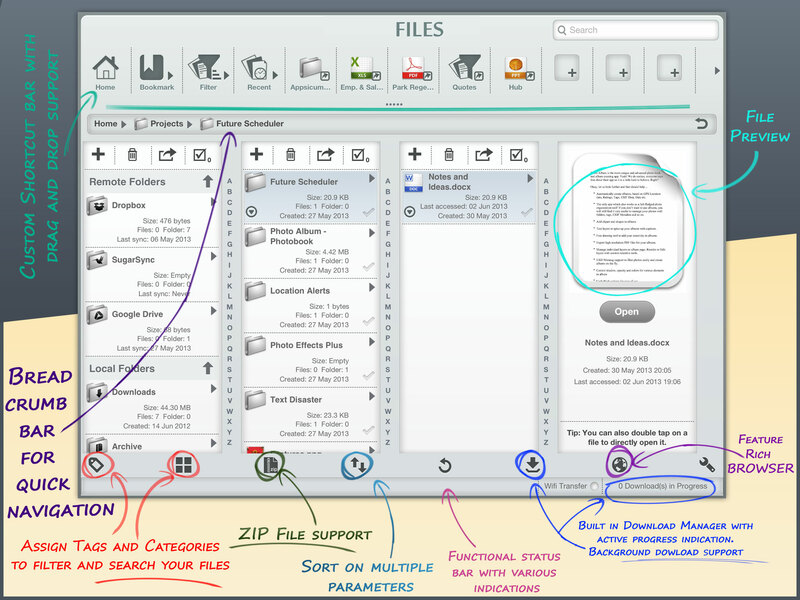 ← Know Why Files-Finder Edition is Best File Organizer App for iPad So Far.